Here are the Overheads from week 6. 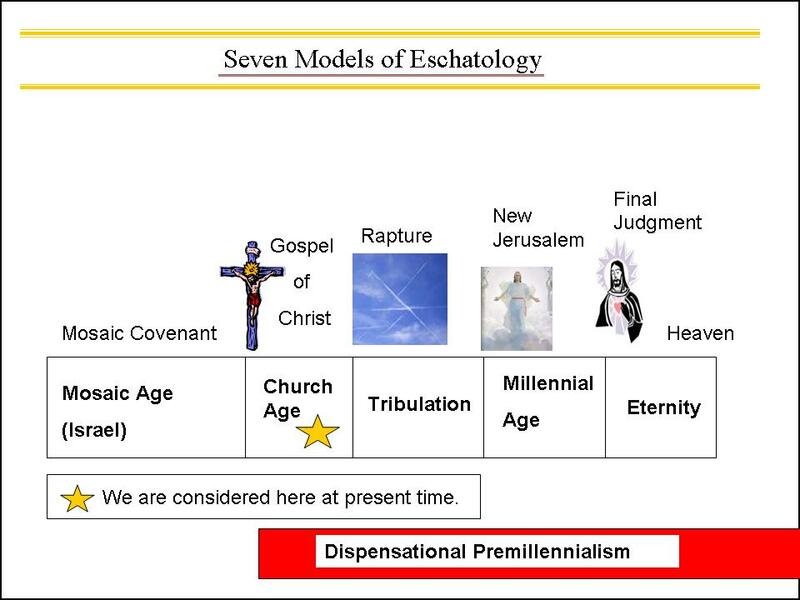 It’s very tempting to start Dispensational Premillennialism (DP) the way old sea maps use to warn “Here thar be dragons” as a tip of the hat to those eschatological expositors who take Revelation to its literal extreme even to the extend of teaching there will be literal reptilian, scaly, fire-breathing dragons as the events John revelated unfold. Whether as some teachers maintain that they will be conjured up from some netherworld or as others suggest arrive from Outer Space this is the eccentric eschatological model John Darby (who was named after one of Britain’s greatest seadogs) and a motley crew launched from Great Britain in the 1800s that found a home in the U.S. in the 20th Century and still reigns supreme among all models here today. It is a wonderfully entertaining model, frightful yet intriguing, complex yet literal, futuristic yet always imminent. For many people this is THE interpretation of the book of Revelation. They don’t even know the other models exist so thorough has been its penetration of the eschatology market place in the U.S. This is the model of the secret rapture, separate destinies for Israel and the church, where the great plagues are unleashed on the earth, and the Anti-Christ deceives Israel and aligns all the nations of the world in the final battle of Armageddon against the Saints at Jerusalem before their ultimate destruction by Christ at his Second Coming. If it were a TV show I think it would be a Western where the gang of ruffians (the Anti-Christ, Beast, and their followers) ruffs up the local townsfolk (Jerusalem) and at the last moment the new sheriff (Christ) arrives to subdue the bad guys and restore order (New Jerusalem). You can que the Western theme music here if you like. This video is well done and a great way to start exploring the DP model. Since other models got to make a case for Caesar Nero being the beast in Revelation it is only fair the advocates of a future fulfillment of the beast prophecy get to make a case as they see it. There are many contenders for the beast in this model here is an interesting one. It’s small wonder that “Anything Goes” in the DP and that every single bible teacher has a slightly to radically different interpretation to the sequence of events that will take place in the “end times.” The DP is a complex web integrating Ezekiel, Daniel, Zechariah, (sometimes other prophets as well) the Gospels, various epistles, and Revelation. Since believers hear a different version of it every time they hear it taught and it comes from a dazzling (indeed dizzy) array of biblical sources it is destine to create endless confusion for believers. Many of the best prophecy teachers begin their interpretations of the future by starting their timeline in the ancient world. Most mainstream models of the dispensational persuasion begin with the book of Daniel and his interpretation of Nebuchadnezzar’s dream about future Gentile kingdoms. It starts at the top of the statue in his dream and works its way down. The statue was made of a gold head, silver chest, bronze midsection, iron legs and clay mixed in with the iron at the feet. Babylon represented the gold head, the Medo-Persia Empire the silver chest, Alexander the Great the bronze mid-section, and Rome the iron legs. No argument from anyone here. Then things begin to get more challenging as different would be prophecy interpreters grabble with how to transition from the Roman Empire to the future. Often this transition goes down a path indicating that the clay represents a broken Roman Empire during the remainder of human history. Many claim that some sort of reconstituted Roman Empire will be the entity that the Anti-Christ and/or beast rises from and opposes modern day Israel. Some arguments follow along the lines that the solid iron represents the Roman Empire under one ruler and when mixed with the clay it is representative of different European monarchs or dictators down through history who have tried to bring Europe under their rule and/or is reconstituted in the form of different nations aligning with one another such as the European Common Market. In either case since there is clay mixed in with the iron it is not as successful an alignment of the different nations under common authority as Rome achieved. Still it’s a loose confederation of the Roman Empire which gives rise to the Antichrist and/or beast. To arrive at the moment in history where the Antichrist/beast arrives on the scene you have to restart the ticking of God’s prophetic clock which as been on standby for the last 2,000 years. This too has its origins in the book of Daniel. Most all bible scholars agree the 70 weeks means weeks of years or 7 x 70 years or 490 years (There are all kinds of nit picking how to calculate years such as converting the calendar to lunar years or lunar/solar years, but that is beyond the scope of what we are doing here–just know there seems to be an endless degree of debate on how to calculate the timetable concerning the years). In Western cultures we group years in tens or decades. Here the number of years are grouped in seven’s based on the seven year sabbatical cycle which is the ancient Hebrew way of grouping years. The countdown begins with The decree from Artaxerxes to Nehemiah in 444 BC to rebuild Jerusalem (Nehemiah 2:1-8). The clock runs continuously through the 69th week or 483rd year which is usually considered the time of Christ’s crucifixion. At that point God’s prophetic clock stops and we are waiting for it to resume for the final count down. Depending on whose version of the prophecy you want to use different events can signal the resumption of the final seven year count down. Possible signals are the rapture if it happens at the beginning of the seven year period or the Antichrist deceiving the Israeli’s and signing a 7 year peace treaty with Israel which he breaks 3.5 years into it and starts the Great Tribulation. At some point before the final count down begins the DP model calls for the Jewish people to rebuilt their temple and again commence the system of sacrificial offerings again. 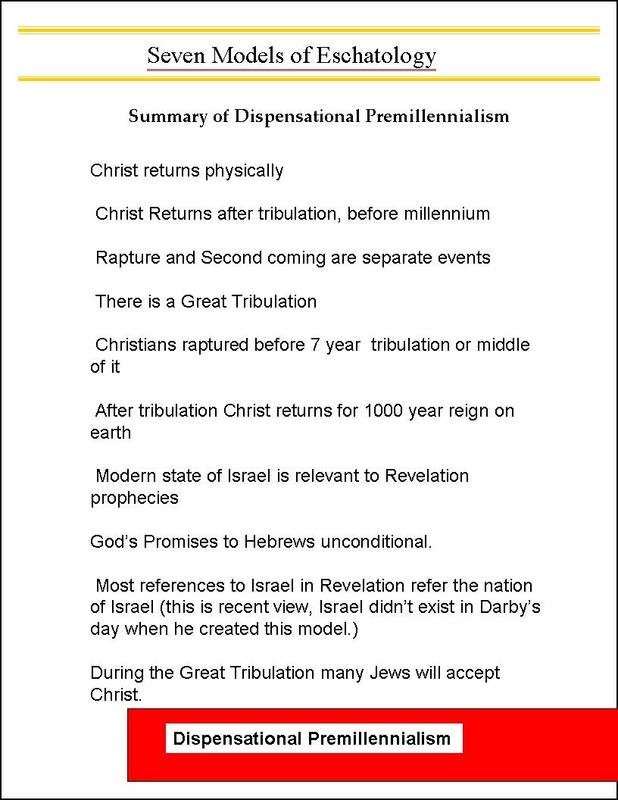 There is debate among advocates of the DP model as to where to put the rapture, but most bible teachers put it either at the beginning final seven year count down or at the mid-way point which is often considered to be the start of the Great Tribulation. This pretty much sets the stage for Revelation Chapter 6 which is where the “apocalyptic rubber meets the road.” If you are addicted to apocalyptic literature this is where it really gets good, if you are living through the end time (i.e. didn’t get raptured–this is where it really gets bad). Note: most bible teachers do use the term Antichrist in conjunction with end time scenarios; however, the term Antichrist is not found in the book of Revelation. It is used in a plural sense in 1 John and 2 John, but there is no one overarching Antichrist mentioned in the bible. The traditional Beast of Revelation of 666 fame doesn’t put in an appearance until Ch. 13, but by then we have already gone past the seals and the trumpets. To deal with this timing dilemma many DP bible teachers believe that the book of Revelation is not written in chronological order or they interject the Anti-Christ into events before the trouble of the seals and trumpets begins to unfold. I’m not taking issue with that or suggesting that a purely left to right reading of the book of Revelation all the way through is the proper way to read it. Scriptural justification for the antichrist being interjected into the end time scenario and rallying his forces and being at least partially responsible for the plagues of the seals and trumpets comes from a “man of sin” or “son of perdition” mentioned in 2 Thessalonians 2:3 or the Little Horn of Daniel 7. It seems all DP teachers have their own slight twists on just how to interpret the relationship between the Antichrist and the Beast of Revelation–some maintain that they are the same and some that they are two separate entities. There about as many ways to interject the Antichrist into the end time scenario as there are DP bible teachers. Anything goes. Most DP teachers make the Antichrist a world leader who signs a peace treaty with the nation of Israel and lulls them into a false sense of security so he can deceive them and then gathers the armies of the world together to fight against Israel. One thing I do have to disagree with on most all DP teachings is the way the terms World and earth are used by them. The use these terms as if they applied to the entire globe or planet earth the way we use the terms in modern Western literature or culture is not the way the bible authors used those terms which applied to the local area around Judea or the nations around the Mediterranean sea. The writers of the bible didn’t know the world is round they still believed the world was flat and never envisioned armies from around the globe all converging to attack Israel. In the first seal the rider is on a white horse which gives way to much debate. This could represent Jesus or the Holy Spirit spreading the gospel through out the entire world, but most in the DP model argue that the white horse represents just the appearance of the Antichrist–that he will appear to be a great messianic leader who can save the world and in reality turns out to be a great deceiver who is the proverbial wolf in sheep’s clothing. In most DP scenarios it would be fair to say the Antichrist comes on the scene as some World political leader, the rapture of the saints takes place about this time and we are ready to proceed with the seals mentioned in Revelation or as they are sometimes called the “Four Horsemen of the Apocalypse” (Conquest, war, famine, and death). 5th seal — Martyrdom & persecution of believers on earth/martyred saints asking God for revenge. 6th seal — Cosmic disturbances–earthquakes, storms, etc. Some say stars falling to earth is war in heaven and Satan’s followers being kicked out. (overlay with Ch. 12 and Dragon and followers being cast out). In conjunction with the seals being opened God seals the 144,000 Jewish believers who are sealed up or protected from the curses being poured out on mankind. Their job is to evangelize the world during the period of tribulation. Note: either this happens in chapter 7 or this event is not in chronological order and happened back in chapter 6 time period and is just being described in chapter 7 or they would have to be survivors of the plagues of the seals. Either scenario is plausible. First trumpet — third of earth burned, interpretations range from nuclear war to meteors and volcanoes erupting. Fourth trumpet– third of sun, moon, stars blackened, supernatural causes or symbolic of events like political upheaval. Two Witnesses — Elijah is often identified as one of them, sometimes Moses as the second. They have power to protect themselves but are over come after 1,260 days by the Beast or the Antichrist. Bodies lay in streets of Jerusalem for 3.5 days before they are taken up to heaven. Sixth bowl — Euphrates river dried up so Kings of East can cross and gathering armies of the world for battle of Armageddon. The destruction of Babylon — many DP bible teachers see this as nuclear war. This could be where other passages from other books of the bible are brought into the end time script. Some where amongst all the future wars most DP teachers find a place for Zechariah 14:12 which states their flesh will rot while they stand on their feet their eyes will rot in their sockets and their tongues will rot in their mouths all which of course sounds like the result of modern weapons of mass destruction. Also, Ezekiel 38 which references the “distant north” seen by many as Russia and Ezekiel 39 which describes the destruction of Gog and it taking seven years to burn their armaments and seven months to bury the dead. Second Coming of Christ on a white horse and his victory over Satan and his armies at Armageddon. Satan bound for 1,000 years during the Millennial reign of Christ on earth. Satan loosed for a short season to create one final rebellion which is crushed when fire rains down from heaven. The Great White Throne Judgment — judgment for punishment of the wicked who have died and not yet been judged. Of course no discussion of the DP model would be complete without including its most unique feature–the rapture of the saints. The DP model introduced the concept of the rapture. It is the only model which contains a rapture event. Next week we will look at how the rapture theory came into being, this week we will simply focus on what it is and the scripture support cited for it. Rapture—the word is not found in the bible. It is the concept that Christ will come back to earth to remove his believers, and take them to heaven, before the beginning of the Great Tribulation. 40 Then two men will be in the field; one will be taken and one left. 41 Two women will be grinding at the mill; one will be taken and one left. 51 Behold! I tell you a mystery. We shall not all sleep, but we shall all be changed 52 in a moment, in the twinkling of an eye, at the last trumpet. For the trumpet will sound, and the dead will be raised imperishable, and we shall be changed. 53 For this perishable body must put on the imperishable, and this mortal body must put on immortality. Is the United State in the end time prophecies? In my personal opinion the U.S. is not in any way, shape, or form mentioned, alluded to, or made reference to in any part of the bible and not found anywhere in end time scenarios, but there are plenty of people who would beg to differ so here are what some others believe and a link to their web site where they make their case. The Lion with his wings cropped off alludes to the U.S.-(the site this goes to has disappeared has, but if I find a similar site I will link to it) . Takes a bunch of scripture about other things and applies them to the U.S.-link. U.S. is the beast rising up out of the sea-link. I’m not going to get too far off the reservation and start chasing UFOs, but just to show you how the DP model can adapt to the times, if you Google “bible, rapture, UFO” you get 102,00 hits. If you do “end times, rapture, UFO” you get 42,700 hits. So plenty of would be bible teachers mix end time speculation with the arrival of UFOs in some form or another. The DP model is primarily found in fundamental and evangelical circles in the U.S. and countries where U.S. missionaries have made inroads. 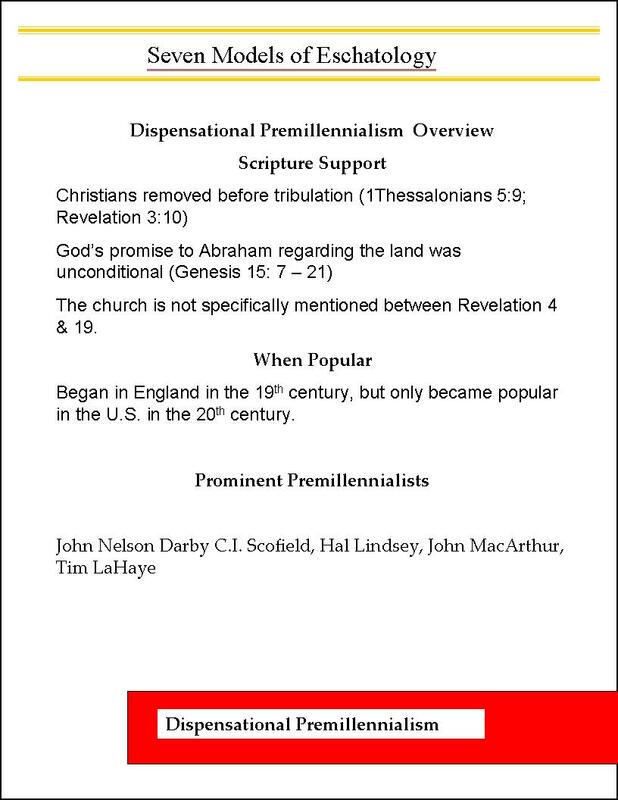 The largest denomination in America, the Southern Baptist, don’t officially endorse the concept of the rapture, but the Southern Baptist Convention does acknowledge that many of its members believe in either a pretrib, midtrib, or post trib rapture as well as historical Premillennialism which does not include a rapture event. Here is link to their official word on it. Next week we will look at how the DP model came into being in the 19th century and how it spread through out the U.S. There are an endless variety of scenarios in the DP model about how the events in Revelation will unfold (Anything Goes). Here are some links to some of those scenarios.